Peter Pi (@heisecode) is a security researcher of Trend Micro Zero Day Discovery Team. He used to be an Anti-APT engine developer and now works on 0-day analysis and discovery. He has 4 years of experience on APT offense and defense. He has catch several Flash 0-day attacks in the wild and collaborated with Adobe to release out-of-bands patches. 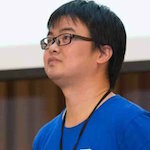 He is named as Top 1 Researcher of Google Android Vunerability Reward Program (2015.6-2016.6). He also reported many bugs to other vendors like Tesla, Apple and Microsoft. He has spoken at BlackHat and HitCon.